The analog input terminal KL3408 processes signals in the range between -10 and +10 V. The voltage is digitised to a resolution of 12 bits and is transmitted, electrically isolated, to the higher-level automation device. The KL3408 combines eight channels in one housing and is particularly suitable for space saving installation in control cabinets. 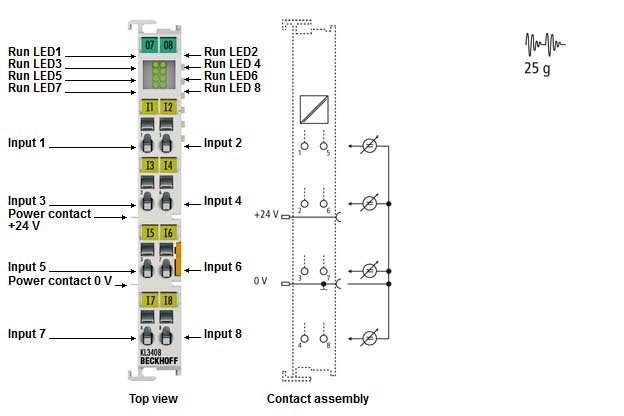 The use of single conductor connection technology enables the connection of multi-channel sensor technology with minimum space requirements. The power contacts are connected through. The reference ground for all inputs is the 0 V power contact. The LEDs indicate the data exchange with the Bus Coupler.